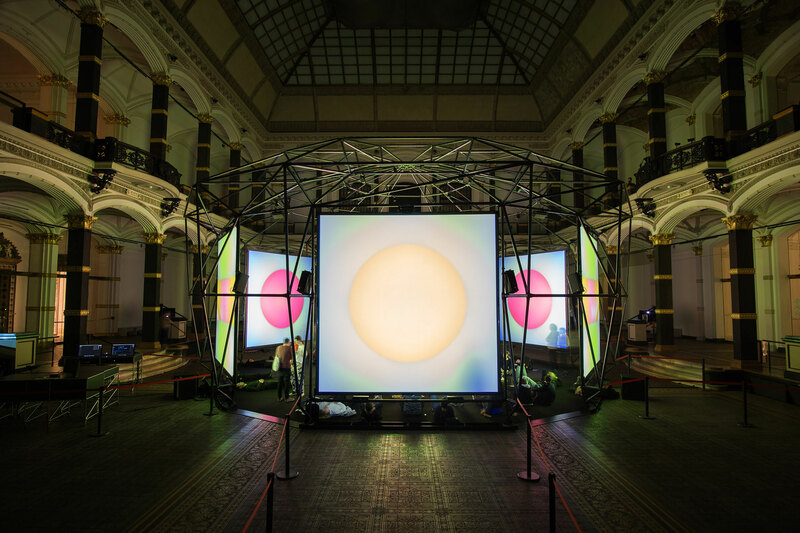 During the spring of 2018, the ISM Hexadome was viewed and experienced by visitors to the atrium at the Martin Gropius Building in Berlin. 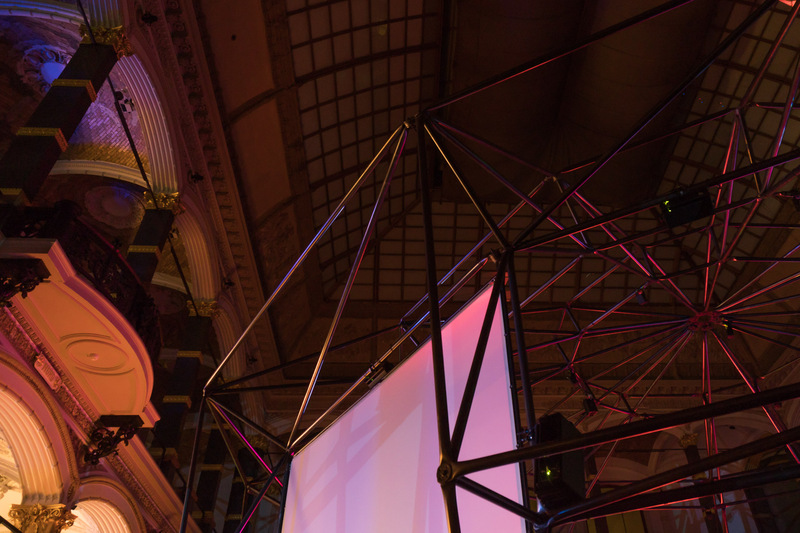 Nine outstanding international contemporary artists presented their installations and performances in the fields of sound and visual arts. 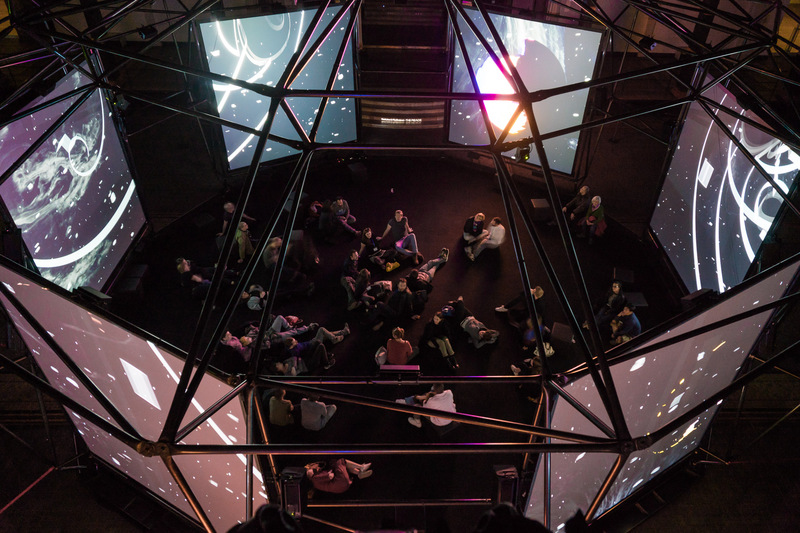 The ISM Hexadome is a 360° exhibition for cultural appreciation of sound, immersive art and electronic music developed by the Institute for Sound & Music (ISM) together with the Pfadfinderei design and motion graphics studio and the ZKM | Centre for Art and Media. 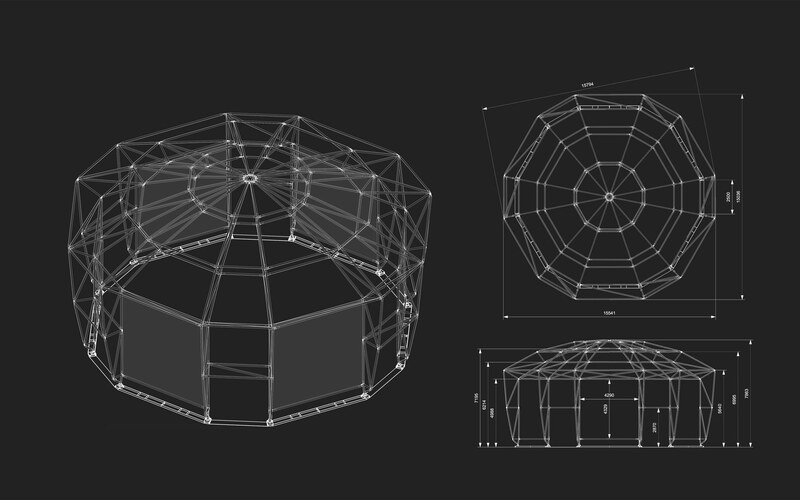 The name “Hexadome” is a reference to the basic geometrical form of the dome structure. Six cantilever modules together make up its basic structure. 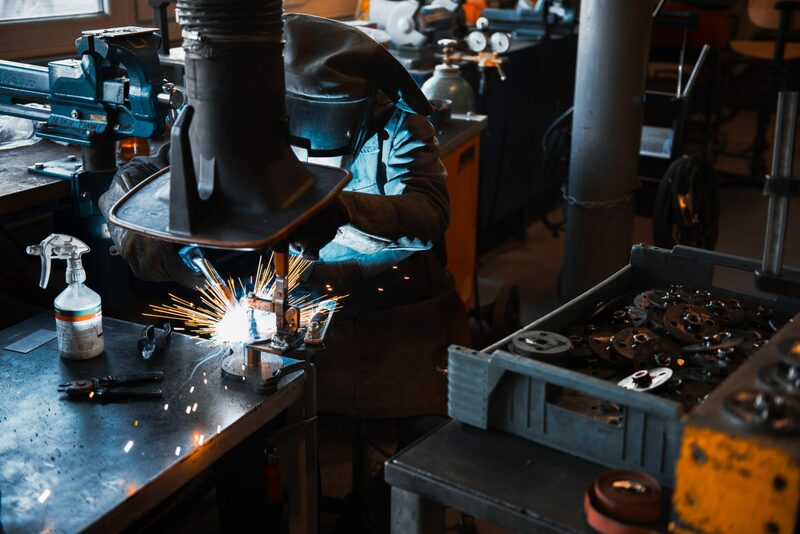 These parts are pre-assembled on the ground, raised and positioned at their base points using articulated joints and then firmly fastened together. 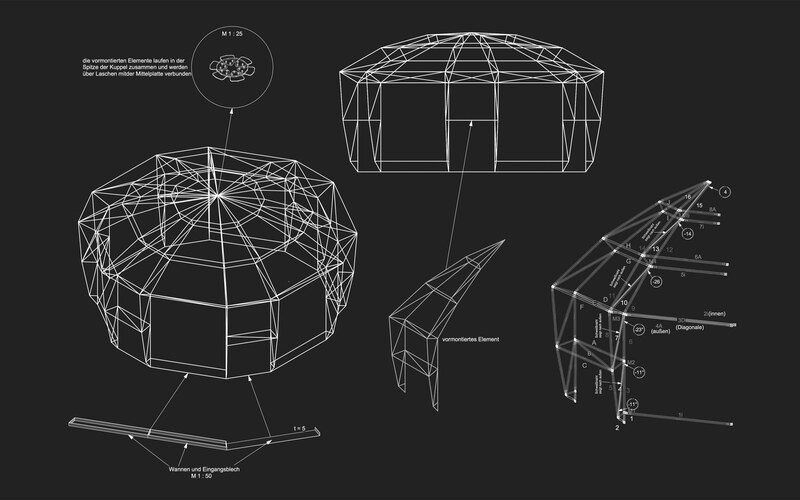 The six projected surfaces, each in 4 x 4 metre format, surround the viewer when he or she enters the dome. 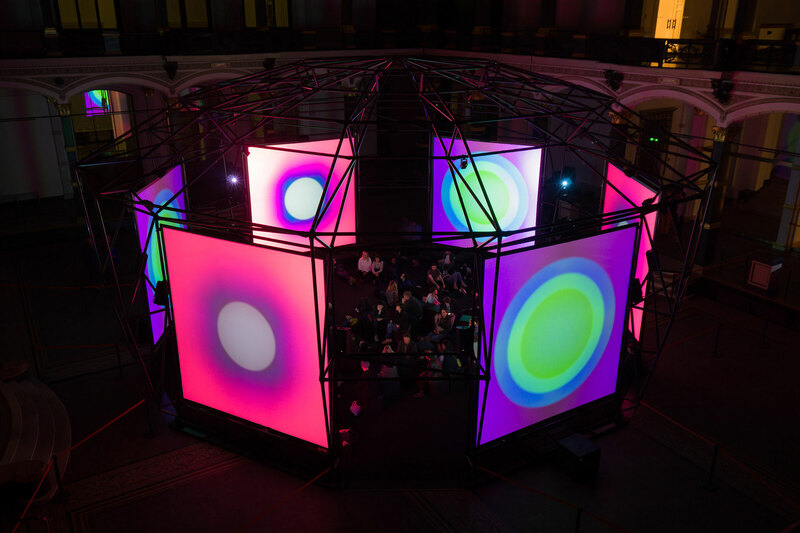 The multimedia works developed by the artists contributing to the Hexadome exhibition are projected onto the screens from outside the structure. 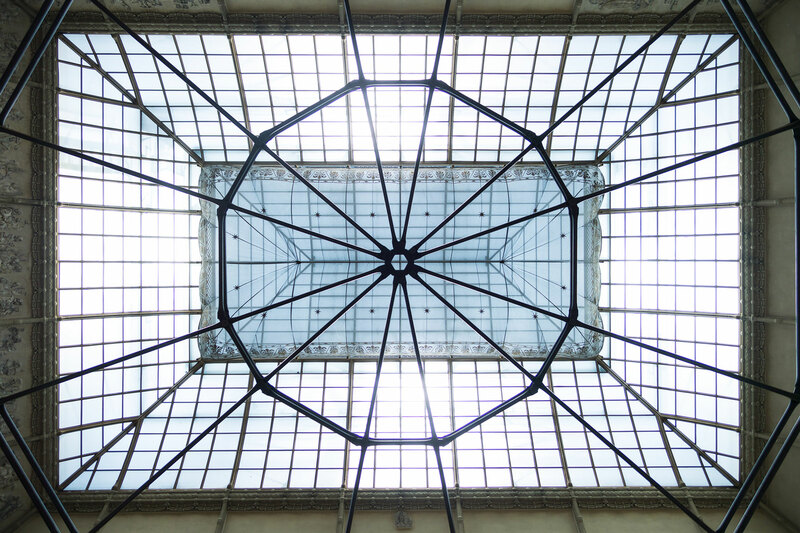 With the exception of the projection surfaces, the structure was left entirely unmasked, thus making the structure’s references to the historical atrium of the Martin Gropius Building all the more visible. 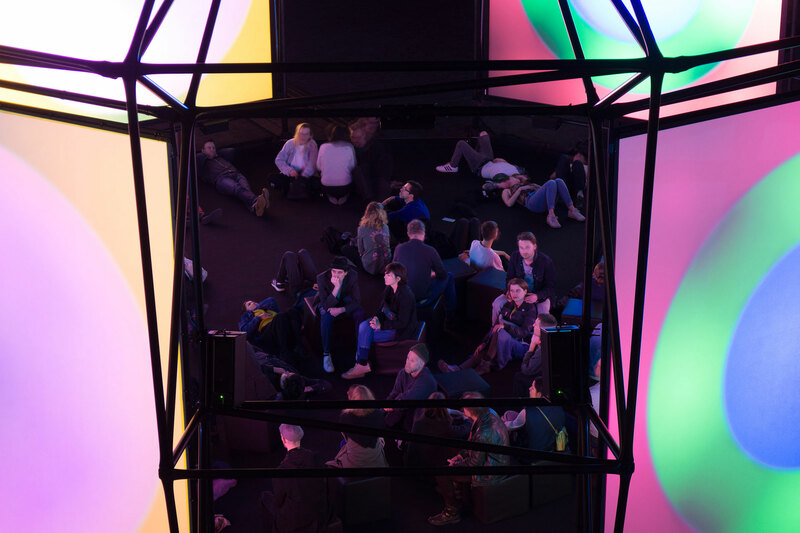 Aside the visual elements, the ingredient in which visitors to the dome will immerse themselves more than anything else is the exhibition’s 3D sound experience. 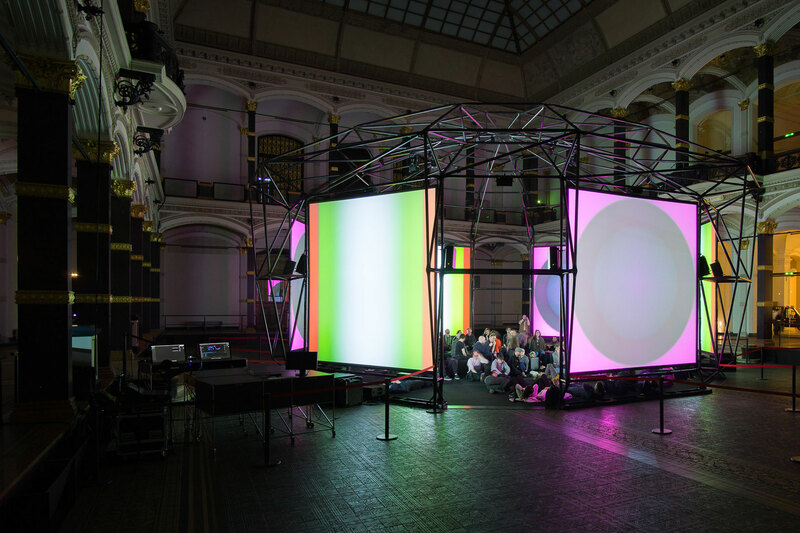 That sound experience is produced by the custom set-up developed by ZKM | Centre for Art and Media. 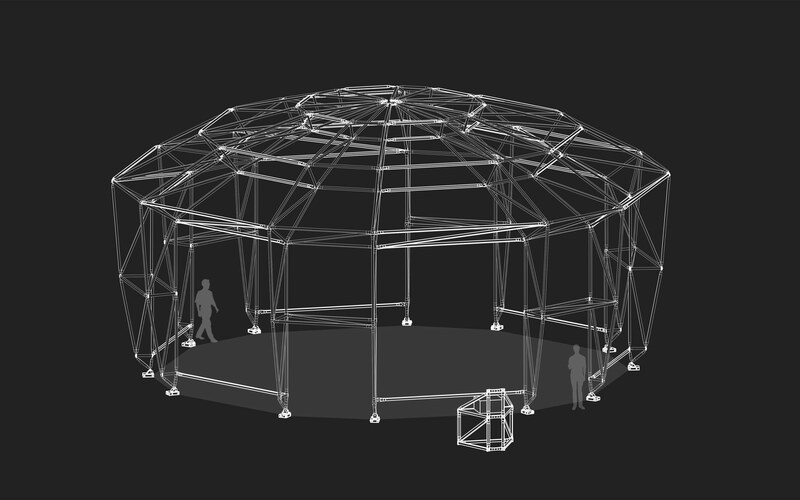 With the 52 speakers distributed all about the structure, the “Klangdome” (“Dome of Sound”) is a unique high-tech instrument designed to achieve a spatialisation of sound. 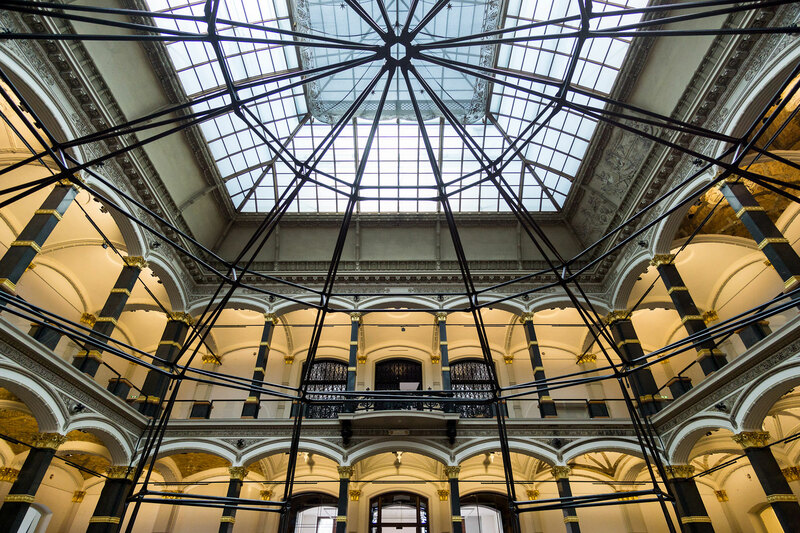 With an exterior diameter of 15.7 metres and a height of 8 meters, the steel structure created by System 180 occupied almost the entire space of the historical atrium of the Martin Gropius Building. 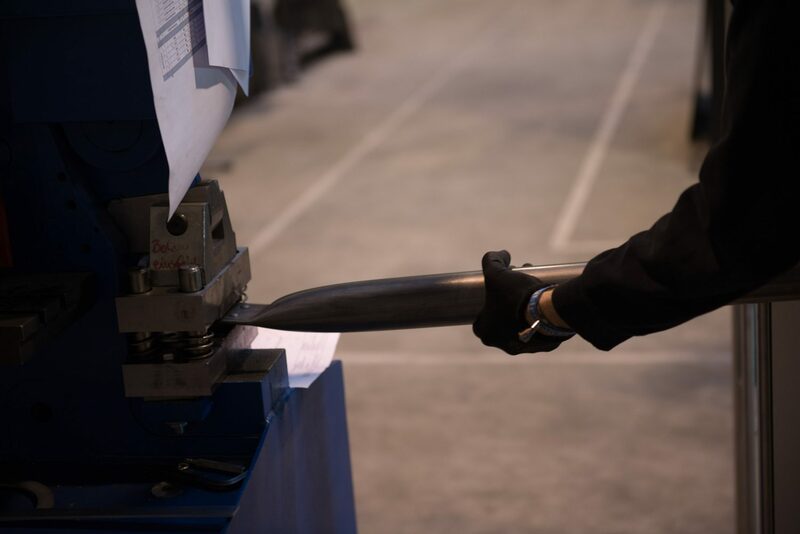 The tubing, with a diameter of 60 mm and using lengths of up to 5 meters, looks positively gossamer on such dimensions. 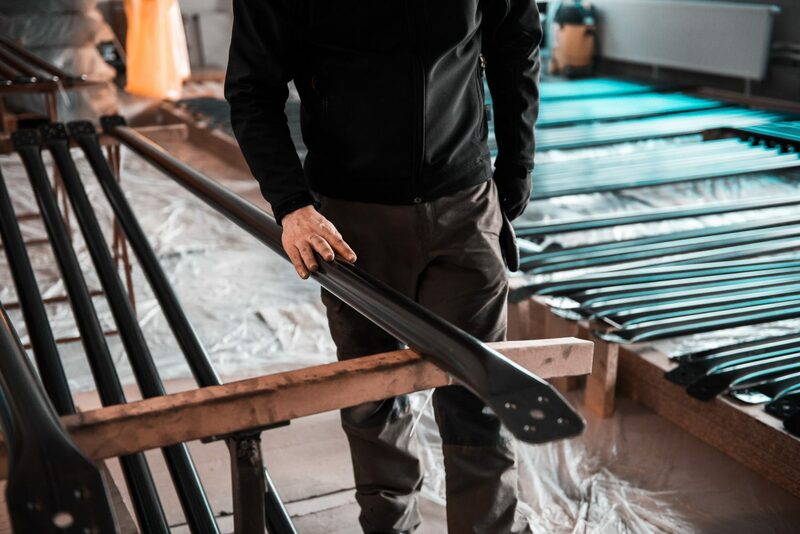 In order to emphasise the structural purity of the installation, we used black steel treated with linseed oil. 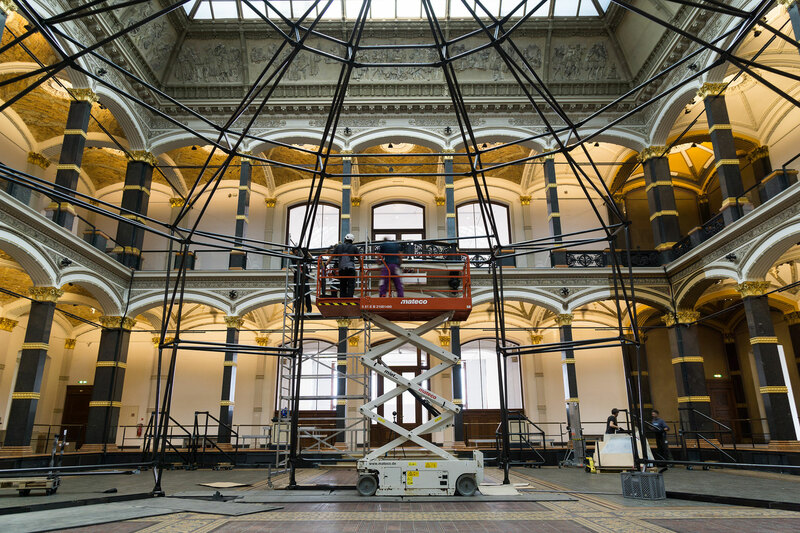 The ISM Hexadome project gave the System 180 architecture team the opportunity to showcase its enormous experience and technical knowledge. 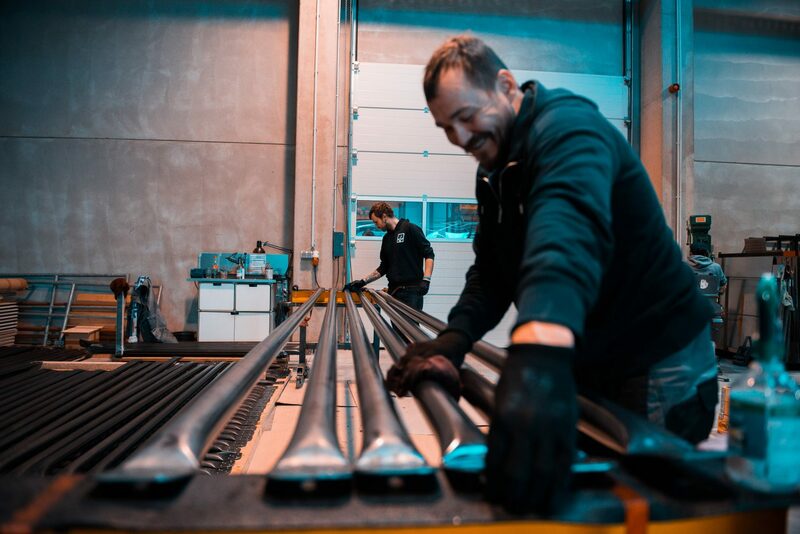 In addition to the design and honed-down quality of the structure – which used only 360 tubing components to enclose a space of 930 cubic meters – our experience of creating structures inside listed buildings was very much in evidence in the work. 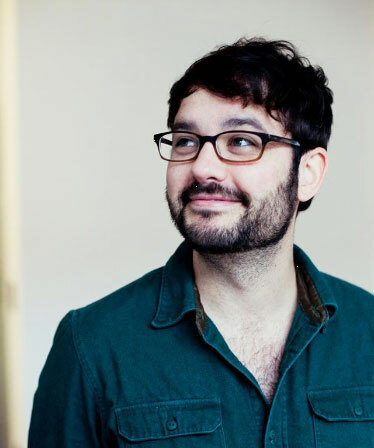 The Institute for Sound & Music (e. V.) has been officially constituted as an association since 2016 with the aim of founding a museum dedicated to sound, immersive art and electronic music. The System 180 team heartily supports this initiative and would like to thank the Institute for their outstanding teamwork in completing an inspiring project.